Neural Mechanisms of ingestive behaviour has long been one of the most intensively investigaged areas within neuroscience. Drug studies have been introduced to develop anti-obesity compounds and, more recently, to identify nerotransmitters which might be involved in the control of ingestive behaviour. The current focus within this field is towards neurotransmitter receptors as it has become known that there are multiple receptor subtypes for each identified neurotransmitter. The study of drug receptor subtypes and ingestive behaviour is growing very rapidly, and has become quite complex. 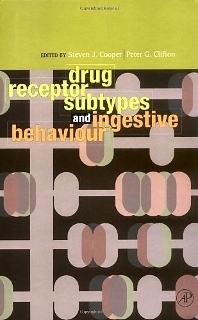 Drug Receptor Subtypes and Ingestive Behaviour is designed to guide students and investigators through a number of different neurotransmitter systems and provide them with the latest information on the identities of receptor subtypes most relevant in the study of ingestive behaviour. As such, it will prove enormously useful to all engaged in studies on appetite and obesity treatment. Receptor Subtype and Affinity State Underlying Cholecystokinin (CCK) Satiety. Cholecystokinin Dopamine Interactions in Satiety. The Role of 5-HT Receptor Sub-Types in Satiety and Animal Models of Eating Disorders. 5-HI Receptor Subtypes Influencing Feeding and Drinking: Focus on the Periphery. Insulin and Serotonin Actions and Interactions and the Control of Feeding and Metabolism. Opioid Receptor Subtype Antagonists and Ingestion. The Stimulation of Ingestive Behavior By Preferential and Selective Opioid Agonists. Opioid Receptor Types and Stimulation-Induced Feeding. Sensitization to the Ingestive Effects of Opioids. Dopamine-Opioid Mechanisms in Ingestion. Dopamine Receptor Subtypes and Ingestion. Imidazoline Receptors and Ingestion. Medial Hypothalmic A2 Adrenergic and Serotonergic Effects on Ingestive Behavior. Clutamate Receptor Subtypes in Lateral Hypothalamic Stimulation of Eating. The Receptor Bases of Neuropeptide Y-Induced Food Intake. Benzodiazepine Receptors and the Determination of Palatability. Neurochemical Interactions in the Control of Ingestive Behavior. Department of Psychology, University of Durham, U.K. Laboratory of Experimental Psychology, School of Biology, University of Essex, Brighton, U.K.